On the 14th of March, 2011 hosted by the 4th Forum For the Future of Agriculture at “The SQUARE” conference center, OPERA organized the seminar “Agricultural Market Stabilization system policy instruments to be included in the CAP”. In the presence of a large majority of the agricultural stakeholders, (MS Authorities, EU institutions, European Associations, Academia and the private sector) OPERA presented in the seminar its latest report. Professor Daniele Rama, UCSU Milan- Institute for Agro-food Economics, presented the OPERA Policy Recommendation Paper “Agricultural Market Stabilization System – policy instruments to be included in the CAP” focused on solutions to address market volatility. The director of OPERA Research Center Ettore Capri, welcomed the audience and Tierry de l'Escaille, Secretary General of ELO hosted a panel discussion with Tassos Haniotis, Director DG Agriculture, European Commission, Andrzej Babuchowski, SCA Spokesman, Permanent Representation of Poland to EU, Russell Mildon, former Director for Market Management DG Agriculture and Professor Daniele Rama. Prof. Rama in his presentation underlined the role of technology as paramount in managing the risks associated with the production process. The reduction of yield volatility could be sup ported by effective technologies for pest and disease management, he said. The global climate change drives the need for higher investments in uptake of technologies and proper crop management to address future threats to agricultural production. Furthermore, he mentioned the influence of innovation, as it is important that its potential is taken into account when considering the requirements for supply stability. The price and income volatility has to be addressed in the CAP with the components of “Price and income safety net” as well as the “Risk Reduction”, said Prof. Rama. Price and income safety net should address directly the issue of the excessive volatility of agricultural common prices, while risk reduction should address the production and income related risks so as to reduce the exposure of the farmer to the abnormal variations of the market. Concluding, he stated that price volatility in agricultural markets has the role of sending a signal to consumers and farmers on the balance between supply and demand. However, extreme volatility can create major difficulties not only for individual businesses but also for an entire sector or state. The existing instruments should be used to protect farmers from such situations. Finally, he referred to the importance of market transparency. An improved system is needed to expand and enhance the quality and accuracy of the data collected and made publicity available on market prices at all levels of the food chain in the Member States. The production of regular and timely forecasts on the agricultural prices plays an important role as well, and an improved common data collection framework for such information and forecast systems to be effective is required. During his intervention Tierry de l'Escaille, on the position of ELO regarding the agricultural market stabilization, underlined that CAP should guarantee a fair price for the agricultural productsas well as that farmers should benefit from a certain degree of income stability. Summarizing, he stated that ELO believes that policies aimed at improving market stabilization should have an important role within the CAP 2020. Tassos Haniotis, commenting on OPERA’s presentation stated that the increase of the agricultural products was much lower in comparison to elements such as energy, fertilizers, materials and minerals. Furthermore, he mentioned that the existing gap between the input and output prices of EU-27 should be covered by productivity. Andrzej Babuchowski, indicated that for managing volatility attention should focus on the selection of the right tools as well as on the creation of new ones. Market transparency was again considered crucial for proper market functioning. Russell Mildon,focused on the lack of market transparency and the differences between the Member States as factors that enforce the market instability. 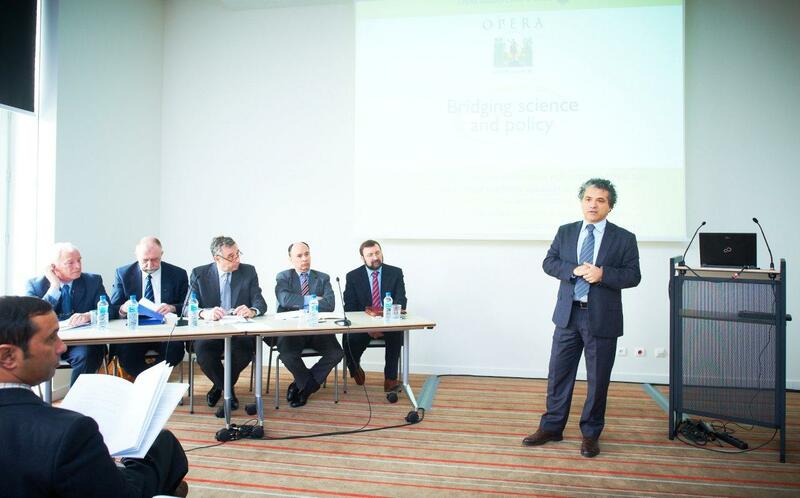 Generally, the report attracted the interest of the audience and the OPERA was encouraged to continue its work in providing support and recommendations of pragmatic solutions to build a sustainable agricultural system in Europe. The success in reaching the successive objectives established for the CAP has been strongly connected with its instruments to ensure market stability. This provided for a better environment to develop farming and a greater appetite for investment in new and productive technologies. CAP has gradually switched support from market and price management to direct payments. This market-oriented CAP means that farmers must take responsibility for managing those risks that were formerly absorbed by market and price support policies. No doubt about it, the fluctuations in the markets also gravely influence on the income of the farmers and indirectly on their production decisions in the future. The high peaks of the price fluctuations are not transmitted properly to the production activity; hence their influence on the production decisions does not reflect market trends. The paper Agricultural Market Stabilization System – policy instruments to be included in the CAP would like to review the possible policy and technological options to address market stability seen from both ends of the food chain. This paper will propose a comprehensive system of measures to be included in the CAP to ensure market stability. These can include, but are not limited to, measures related to: supply and demand management; price management; capital structure, credit, hedging, insurance, and technology. The proposal is based on the existing CAP system for market stability which needs to be improved and not radically reformed.